If the condenser is replaced with a new one, add compressor oil to the new condenser. 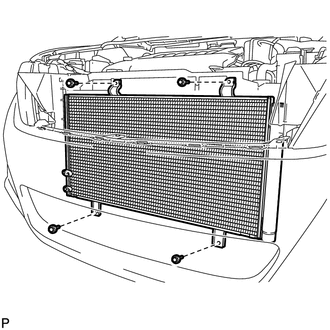 (a) Remove the attached vinyl tape from the tube and the connecting part of the cooler condenser assembly. (b) Sufficiently apply compressor oil to a new O-ring and the fitting surface of the tube joint. 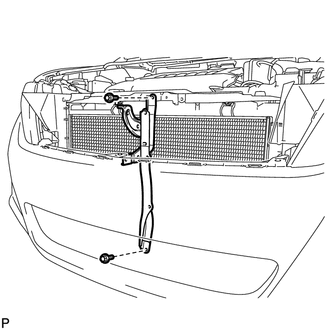 (c) Install the O-ring on the air conditioning tube and accessory. Keep the O-ring and O-ring fitting surfaces clean from dirt or any foreign objects. (d) Install the air conditioning tube and accessory on the cooler condenser assembly with the bolt. (a) Remove the attached vinyl tape from the pipe and the connecting part of the cooler condenser assembly. (b) Sufficiently apply compressor oil to a new O-ring and the fitting surface of the pipe joint. (c) Install the O-ring on the discharge hose. 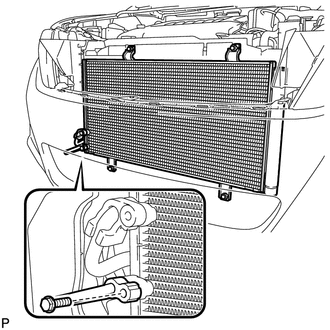 (d) Install the discharge hose on the cooler condenser assembly with the bolt. 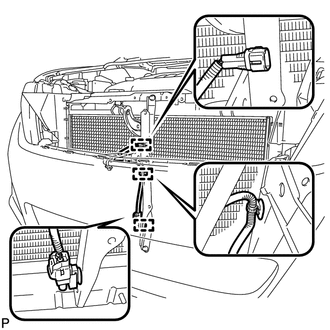 (a) Install the hood lock support sub-assembly with the 2 bolts.